She was born April 21, 1960 in Marion to the late Gene and June (Freeman) McCarty, she was also preceded in death by her husband Charles “Greg” Kimler, they were married October 15, 1988 in Magnetic Springs and he died June 1, 2017. Becky was a 1978 graduate of the North Union High School. 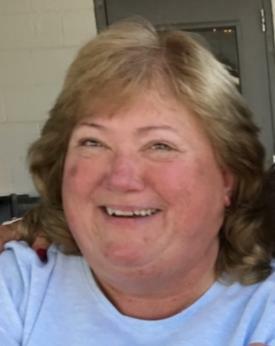 She retired as a Budget Controller from Honda in June of 2016 after 33 years. Becky’s life was centered around her family, she was known for helping and taking care of the people close to her. She enjoyed watching OSU sports with her son Ryan and was an avid collector of pig “stuff”. Becky loved to shop, she and her late mom shared a great collection of towels. Lately there were two things that kept her busy, working to complete “Becky’s Barn” near Magnetic Springs and her new puppy Sammy. Surviving is her son Ryan Kimler of Marysville, brothers: Bill McCarty and Joe (Joyce) McCarty both of Magnetic Springs. Nieces and nephews: Jamie (Mike) McCarty, Chelsey (Damian) Ramos, Rochelle (Logan) Guisinger, Noa, Riley, Stella and Violet and many extended family. Funeral services will be held Thursday January 17, 2019 at 11:00 am at the Stofcheck-Ballinger Funeral Home in Richwood, Chaplain Greg Wolfe will officiate, burial will follow in the Hopewell Cemetery. Friends may call Wednesday from 4-7 pm at the funeral home in Richwood. Memorial gifts may be made to Loving Care Hospice, P. O. Box 613, Marysville, OH 43040. Growing up in a small village - you know everyone. I was saddened to hear of Becky’s passing. My condolences to the family. So sorry to hear this news. Worked with Becky for 30 years at MMP (motorcycle plant). It’s so true when you hear people refer to those of us that spent the bulk of our career at Honda in this plant as “Family”. We truly were, and the lord knows it hurts to lose a family member. Fly with the Angels Bec, May God bless you all! So sorry to hear Of Becky's passing. She was a dear lady who loved her family. Magnetic Springs United Methodist Church will miss her, as will we. So sorry to hear this. I consider it a blessing from God to have had the opportunity to work with her. May God bless and care for the family during this difficult time. Becky was a very sweet girl, and I know her family will miss her greatly. I was shocked to her of her passing. To her family and friends, I send my deepest sympathies. Ryan,our prayers for you, family and friends continue. We are so sad that you are having to travel this journey. One step at a time you can do do this. Noa, Riley and Sammy will likely provide you with some bright spots. Dear Bill & family. I am so very sorry for your loss. Please know you are in my prayers. I am so sorry to hear this. Becky was a great person! I always enjoyed catching up with her and also had the pleasure of working with Ryan. My thoughts are with him and her family. So sorry to learn of Becky's passing. Prayers of comfort to all your family. I worked with Becky at the start up of NAEC & HNA. She was such a nice & pleasant person. I am saddened to hear of her passing. My deepest sympathies go out to her family. Dear Bill, I am so very sorry to hear of the loss of your sister. Please know that you and your family are in my thoughts and prayers. Sending my thoughts and prayers to Becky's family,especially Ryan. Ryan, I am so sorry to hear of your mom's passing. I was best friends of your Grandmother Janice. My thoughts and prayers are with you. I was heartsick when I heard of Becky's passing. She was a good person and fun to be with. I was blessed to have her as a friend. My deepest condolences. Bill, my heart goes out to you! Sending my prayers and love! So very sorry for your lost. Prayers for all the family and friends and hugs of comfort. It still doesn't feel real or seem possible. Becky was always a kind and caring person. Thoughts and prayers to the family during this difficult time. I can remember many times in the summer playing with you Becky at your house as kids. I’d be with Aunt Opal and Uncle Pete and we’d come to visit. I can remember that little play house trailer in your back yard. We always had so much fun. RIP, say hello to aunt Opal and uncle Pete for me. How I miss them. I worked with Becky when I first started at Honda and then later on prior to her retirement. I'm so saddened to her of her passing. My thoughts and prayers are with her family. #25 Private Log in to view. I'm so sorry for the passing of your sister Becky. My deepest sympathies to you all. #30 Private Log in to view.